It’s hard to document whether the original Thanksgiving feast included turkeys, but the turkey has certainly come to symbolize the American holiday of thanks. The USDA estimates that around 45 million turkeys are sold and eaten during the Thanksgiving holiday. Yes. We gobble up a lot of turkey on Thanksgiving, and most of those are baked in the oven though Fried Turkey is quickly gaining in popularity. The first decision to make is whether to get a frozen or fresh turkey. A frozen turkey is generally less expensive. The sale prices close Thanksgiving can be amazing, and for folks with big freezers, stocking up on turkeys is a great deal. Turkeys do take up a lot of room both in the freezer and in the refrigerator, so do keep that in mind. It takes a long time to thaw out a frozen turkey. The rule of thumb is that the turkey needs to be in the refrigerator thawing one day for every five pounds of weight. I generally add a day or two extra for good measure. A turkey can also be thawed in a cold water bath. Fill the sink or a big pan with cold water and let the submerged bird sit and thaw. This method takes, on average, seven to eight hours. It’s important to change the water as it warms up. You don’t want to taint the turkey and make all the guests sick. With a fresh turkey, you’re ready to cook immediately. You’ve got to place an order with the butcher though. Don’t expect to walk in the day before Thanksgiving and find a fresh turkey waiting. A monster-sized turkey may look appealing when you’re out shopping. You’re thinking that you’ll make quite a splash with a huge bird. In fact, a gigantic turkey does make a statement. It may also make you curse as well. Remember that the turkey will be in the freezer and the refrigerator taking up space when you’ve got lots of other items that will also need to be stored. If the turkey takes up half a shelf, then you may be stacking other foods. Trust me. Nothing stacks well on top of a turkey. The other issue with a really big turkey is that it’s heavy. Seriously, it’s not much fun to wrestle a 25 pound turkey in and out of the oven. My mom (who does have ample storage space) got a huge turkey one year. I won’t quote what she said when trying to get the turkey out to baste. It was not the Thanksgiving grace though. The bigger the turkey, the longer it takes to thaw and to cook. This may not be an issue at your home, but I’d rather do two smaller turkeys than a huge one. Actually, I’m more likely to do a baked bird and then a Crock Pot Breast. We like the white meat sliced on sandwiches, so the breast in the crock pot ensures that we have extra sandwich meat. My pick for a whole turkey would be the 12-15 pound range. I’d especially recommend this size for beginners. As I mentioned, you need to make sure the turkey is thawed out. If it’s still a bit frozen, then give it a water bath. It’s really hard to cook a partially frozen turkey through. And, it’s not great to cut into the main dish and see that it’s still bloody. Take the bag of spare parts out of the cavity. It’s a really bad surprise to find those after the turkey is baked. Also, you can use the neck to make the gravy, and some turkeys come with a gravy pack there in the cavity. In any case, pull everything out of the bird. Wash the turkey inside and out with water. Pat it dry. If you plan to stuff the turkey, you’ll want to do that at this point. You can make pan dressing if you’d rather not stuff the turkey. I especially like Southern Corn Bread Dressing. Or, you can plan to have both turkey stuffing and pan dressing. Many turkeys now come with the legs hooked together with wire. Some also come with a thermometer installed. If you have a plainer bird, then you probably want to tie the legs together. Just pull them together and tie there at the bones. Otherwise, the turkey looks a bit wild as it cooks and the legs splay out. The first step to ensure a good moist turkey is to pull back the skin over the breasts and stick some butter or margarine under the skin. About 4 TBS of butter per side work well. Once you get the margarine or butter in, press the skin back in place. Rub a little butter all over the turkey and then sprinkle on seasonings. I generally use salt, pepper, and lemon pepper. Place the bird in a big pan if you’ve not already done that. If you’re not using stuffing, then you can put some fresh cut orange slices in the cavity. That adds a nice little zing. I sometimes put onion slices inside and also a bay leaf. These are just for some extra flavoring and are not meant to be eaten later. In fact, take the extra flavoring items out before serving. Get 3 or 4 cups of broth (chicken or turkey) and pour over the bird. This may wash off some of the seasonings on top. That’s fine. Sprinkle a little more on the bird. Loosely wrap tin foil over the turkey and put it in the oven. The USDA previously recommended cooking a turkey to a temperature of 180 degrees F but now has lowered that to 165 degrees F. This is the first year with the new temperature recommendation. Stuffing in the bird (which is not recommended by the USDA) is also set at 165 degrees F. So, it’s easier to remember the target temperatures. 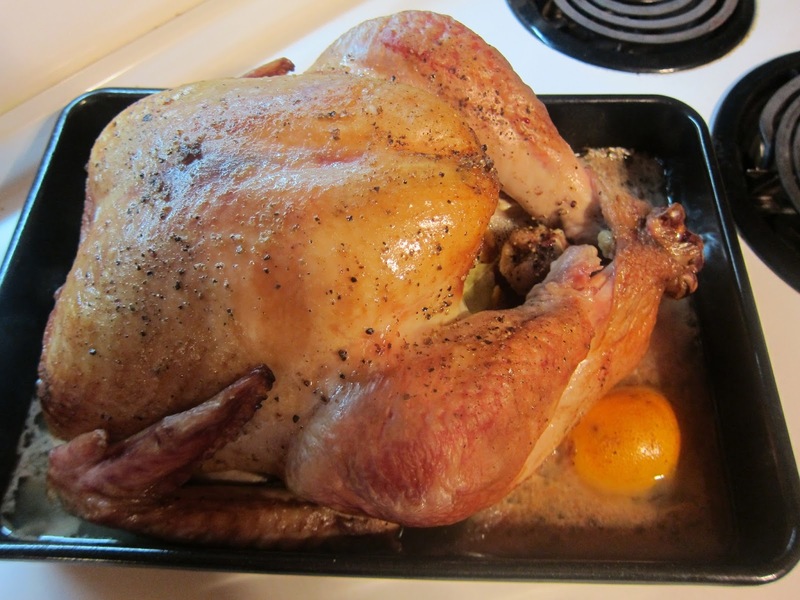 With the oven set at 325 degrees F to 350 degrees F, it takes around 3 to 4 hours to cook a 12 to 15 pound turkey. It’s a good idea to check with a thermometer stuck in the thick part of the inner thigh. It’s really hard to tell if a turkey is done just by looking at the outside. It may look nice and crisp and beautiful, but it may not be cooked through. During the baking, baste the bird with the broth that is in the bottom of the pan. This helps keep the turkey moist. Remove the tin foil during the last 45 minutes to an hour so that the turkey will brown and look pretty. If it’s getting too crispy or dark before reaching the desired temperature, then stick the tin foil back over the bird. Remove the turkey when it’s at 165 degrees F. The temperature will run a little higher as the bird rests. Letting the turkey rest a bit helps set the flavors, so don’t worry about rushing the turkey right to the table. Take your time on the other dishes. The turkey will be fine. That’s it for making a basic baked turkey. It sounds more complicated than it really is. Once you’ve made one, you’re set. You can add all types of stuffings and seasonings to suit your tastes. But, this recipe turns out a moist and tasty turkey that looks great on the table.